(CNN) — One figure has played a pivotal role in the tumultuous events that have swept through Tunisia during the past few weeks, resulting in the fall this weekend of President Zine Al Abidine Ben Ali and his regime after 24 years. But Muhammad Al Bouazizi did not live to see the historic outcome of which he was a key part. Al Bouazizi was a poor 26-year old Tunisian who could not find a job after finishing college. He refused to join the “army of unemployed youth,” as it has become known in Tunisia, and instead started a small business as a street vendor, selling vegetables to support his family. His attempt to overcome his poverty in the streets of Sidi Bouzid, central Tunisia, was halted by a police officer who seized his goods, claiming that Al Bouazizi was working without the necessary legal permit. Rioting followed not only in Sidi Bouzid — a traditional stronghold for opposition against authoritarianism in Tunisia — but across the country as young and unemployed Tunisians took to the streets to protest against living conditions and the economy. Al Bouazizi died of his injuries on January 4: 10 days later Zine El Abidine Ben Ali fled with his family to Saudi Arabia. Each year thousands of young men and women from north Africa try to enter Europe illegally, looking for a better life. They call themselves “harraka” — which translates as “the burners” — because the first thing they do when they reach Europe is to set fire to their passports and documents to avoid being sent back home. Many in Tunisia now see Al Bouazizi as a “harraka” — but in his own way. London (CNN) — Editor’s note: Maha Azzam is an expert on the Middle East and North Africa, and an Associate Fellow at London-based international affairs think tank Chatham House. Corruption has been one of the main features of the Ben Ali regime in Tunisia. It has gone hand in hand with authoritarian control of the state. Opposition groups and the public often spoke of endemic corruption among the Tunisian ruling elite. However, the revelations made by WikiLeaks that in June 2008 the U.S. embassy in Tunis said that “Whether it’s cash, services, land, property, or yes, even your yacht, President [Zine el Abidine] Ben Ali’s family is rumored to covet it and reportedly gets what it wants,” gave even greater weight and proof to an already widespread belief that Ben Ali and his wife’s family, the Trabelsis, were the “quasi-mafia” often referred to by Tunisians. It added to the long list of grievances against a regime that had been in power for 23 years and had remained unaccountable. Anyone doing business in Tunisia, be they local or foreigner, would have been aware of the power and control of the Ben Alis, the Trabelsis and the coteries of power that surrounded them. However, the WikiLeaks revelations added to the “disgust” that many Tunisians had already been feeling at the chasm in wealth prevalent in Tunisian society, a country where unemployment runs at 30%. The widespread protests that erupted were due to economic pressures and corruption, but they were also against a political system that abused human rights and showed no respect for the rule of law. A new generation of Tunisians, connected to the internet and using Twitter , was galvanized to action against a repressive police force and security services. Today’s technology provided them with channels that despite their government’s restrictions, proved invaluable in spreading information and support for the protests, while WikiLeaks merely further exposed an already discredited and reviled regime. Others in the region share the same long brewing discontent. The question now in the minds of many is whether the 50-year-old Egyptian who shouted anti-government slogans in front of the Egyptian parliament before setting himself on fire on Monday, and the four Algerians who have done so over the last few days, echoing the action of Muhammad Al Bouazizi, the young Tunisian who set himself on fire and died in mid-December, will help set in motion a similar chain of events. The man now president, Mohamed Ghannouchi was profiled in January 2006 in a secret US cable in 2006, recently released by Wikileaks. “A technocrat and economist, Ghannouchi has served as prime minister since 1999. Is rumored to have told many he wishes to leave the government but has not had the opportunity. Length of his service as PM also suggests Ben Ali [president until resignation] does not view him as a threat and he is unlikely to be viewed as a qualified successor. However, average Tunisians generally view him with respect and he is well-liked in comparison to other GOT and RCD [ruling party] officials.” Then US ambassador William Hudson said: “Given the fact Ben Ali has a dictatorial hold, it is hard to believe he’ll voluntarily step down.” Even so, “the mere fact an increasing number of Tunisians are talking about the end of the Ben Ali era is remarkable.” Publication of WikiLeaks sourced private US comments on the corruption and nepotism of a hated “sclerotic” regime is said to have helped create Tunisia’s protest, and generated talk by US commentators of a “Wikileaks revolution”. A week ago writing an article for the BBC would have been a sacking offence for Tunisian journalists, writes Haykel Tlili – who works for Le Temps paper, owned by the ex-president’s son-in-law. Here he assesses how Tunisians are taking to changing times. Since the overthrow of President Zine al-Abedine Ben Ali last week the people of Tunisia wake up each day in what still seems to be a dream. Sometimes this turns to a nightmare with the sound of gunfire, something Tunisians are unaccustomed to hearing. But there is a tangible sense of joy and pride that people feel about the popular uprising. They are determined not to let what has been dubbed the “Jasmine Revolution” falter as the country accustoms itself to the change of guard. Change and all that it heralds is being savoured across Tunisia like the smell of the sweet jasmine flower as it opens at night. The latest news about shootings overnight or the arrest of the personal presidential guards is hotly debated in the morning. The announcement of the new government – which contains some of that old guard – has not been met with a ringing endorsement. “We do not want to see any of them in the new Tunisia,” many Tunisians are saying. From Egypt, the foreign minister, who has kept his post, urged Tunisians to remember that the new government is a unity administration. “Its goal is clear, its duration is specified – legally and with the agreement of all parties,” he said, urging calm. 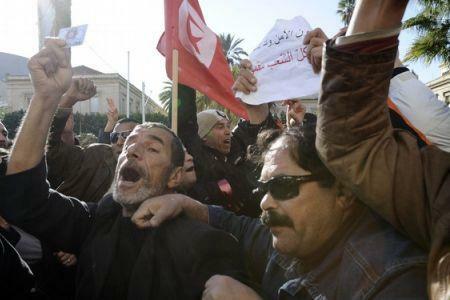 However, three ministers from the General Union of Tunisian Workers (UGTT) have already resigned, wanting demonstrations “to uproot all that is related to the old ruling party”. Yet changes are already visible. Tunisia’s media is emerging from the stranglehold of 23 years of authoritarian rule. Journalists working for the Dar El Anwar media group, which publishes three newspapers, have called for the resignation of their editors in chief. “They were appointed by the ancien regime, and they were suffocating our freedom,” says Asma Sahboun, a journalist at Dar El Anwar’s Echourouk paper. Nadia Barrouta, who works for the Assabah newspaper – the largest of the Dar Assabah Group – explains what it was like working for a pro-government publication. “We were not even able to ask critical questions to any of the officials two weeks ago, it’s like a dream now,” she says. Staff where I work at Dar Assabah, owned by the ex-president’s son-in-law Sakher El Materi, who is now in exile in Dubai, have supported the uprising. We are resolute about not jeopardising the freedom of speech that has eluded us in the past. Regarded by Tunisians as a means of propaganda for the former dictatorship, the media groups are hoping to gain their respect. “The media must become an honest mirror telling them what is really going on,” someone recently said on a television discussion programme. The excitement most people feel about seeing such changes is sometimes overcome by nerves. There are fears of possible conspiracies that could see the return of Mr Ben Ali and the former ruling RCD party. There is also anger in some quarters that human rights activists were let down by the West during the years of RCD rule. After the chaos of the past few days, life is cautiously restarting. And from my perspective as a business reporter, a return to calm is imperative. The turmoil has cost the country an estimated 3bn Tunisian dinars ($2bn; £1.3bn) – and the tourist industry has been badly affected. Many people have been called to resume work at offices, banks and shops. But they will need to know that the way forward will be long and difficult – from the reconstruction of what was destroyed in the protests to the birth of North Africa’s first democracy. Protesters from a rural region in central Tunisia where unrest began a month ago have reached the capital Tunis, adding to the pressure on Prime Minister Mohamed Ghannouchi and his newly-formed government to quit. By News Wires (text) AFP – Some 1,000 demonstrators from rural central Tunisia, calling for the resignation of the transitional government, reached the capital on Sunday. The marchers, from a poor farming region where an uprising against authoritarian rule began last month, called for the resignation of a government put in place after the ouster of president Zine El Abidine Ben Ali. 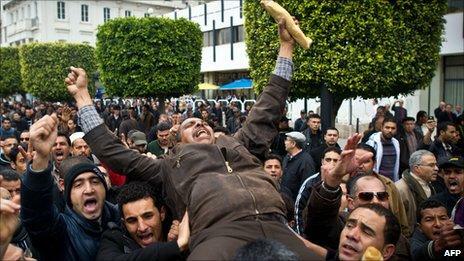 The people have come to bring down the government,” they chanted as they marched through the centre of Tunis. The “Caravan of Liberation” set off on Saturday from the town of Menzel Bouzaiane, where the first victim of a bloody crackdown on protests against Ben Ali was killed last month. “We have come… to bring down the rest of the dictatorship,” said Mohammed Layani, an elderly man draped in a Tunisian flag. There have been daily protests in recent days calling for the resignation of Prime Minister Mohammed Ghannouchi, who has been the premier since 1999 and has stayed on despite the downfall of Ben Ali. Protesters have also called for the break-up of the ex-ruling Constitutional Democratic Rally, the RCD, which has dominated Tunisian politics for decades. A day after quitting the ruling party of former leader Zine al-Abidine Ben Ali, Tunisia’s interim President Foued Mebazaa promised a clean break with the past as protesters continued to press for the departure of the old guard. AFP – Tunisia’s interim president on Wednesday promised a “total break” with the past and hailed “a revolution of dignity and liberty,” as prosecutors opened a vast inquiry against the previous leader. Investigators will look into the extensive domestic and foreign assets held by former president Zine El Abdine Ben Ali, who resigned abruptly on Friday and fled to Saudi Arabia after a wave of social protests against his regime. “Together we can write a new page in the history of our country,” Foued Mebazaa said in an address to the nation in which he also vowed to ensure an amnesty for political prisoners, media freedoms and an independent judiciary. The new government is to hold its first cabinet meeting on Thursday amid protests against the inclusion of old regime figures and for the abolition of Ben Ali’s once all-powerful Constitutional Democratic Rally (RCD) party. In his first public appearance since being sworn into office on Saturday, Mebazaa thanked the army for ensuring security during recent days of chaos. “We have discovered those responsible for the terror in our country. We have arrested these armed gangs,” he said. He also paid homage to “the martyrs of dignity and liberty” — a reference to the dozens of people killed in the protests. Thousands of Tunisians rallied against the new government earlier Wednesday. “We want a new parliament, a new constitution, a new republic! People rise up against the Ben Ali loyalists!” some 2,000 protesters chanted at a peaceful protest in the centre of Tunis — one of several around the country. Negotiations over the inclusion of the main UGTT trade union in the new government also broke down, following the pull-out of four ministers Tuesday. “We cannot take part in a government that includes symbols of the old regime,” Abdessalem Jrad, secretary general of the UGTT labor union after a meeting with Prime Minister Mohammed Ghannouchi. The government meanwhile gave legal status to three parties barred under the previous administration and freed a dissident journalist, Fahem Boukadous, who was sentenced to four years in prison last year for his work. The central bank also took over a bank owned by Ben Ali’s brother-in-law in the first such move against assets controlled by the former strongman’s influential family, which formed the core of Tunisia’s business elite. The authorities also shortened a curfew in place for several days, saying the security situation had improved. But a state of emergency banning public assemblies remains and police have orders to shoot anyone running away. Traffic was visibly heavier in Tunis and some shops and offices re-opened. Mebazaa and Ghannouchi on Tuesday quit the RCD party, which in various forms has dominated Tunisian politics and state organisations for decades and has been one of the main drivers of public anger in the streets. But Ghannouchi and seven other ministers from the previous government under Ben Ali held on to their posts including the interior and defence ministries. “Let’s not throw the baby out with the bath water,” Tunisia’s Le Quotidien daily commented in an editorial that emphasised the new national unity government was temporary and would prepare for democratic elections. “The participation of the RCD in this government should not be a source of discord or a stumbling block,” it said. The tumultuous events in Tunisia — dubbed the “Jasmin Revolution” — have inspired dissidents across the Arab world and sparked protests in numerous countries including Algeria, Egypt, Jordan and Egypt. Tunisia’s new leadership is due to hold democratic parliamentary and presidential elections in the next six months, although no dates have been set. Under the constitution, elections should be held in less than two months. The banned Islamist Ennahdha (Awakening) movement has said it will seek to acquire legal status as a political party to take part in the elections. One of Ben Ali’s fiercest critics, Moncef Marzouki — who has said he intends to run in the presidential election — also returned to Tunisia on Tuesday after years of exile in Paris, amid emotional scenes at Tunis airport. On Wednesday he visited the tomb of Mohammed Bouazizi, the 26-year-old graduate forced to sell fruit and vegetables to make a living who set himself on fire last month to protest against the seizure of his stand by police. His suicide sparked off the protests against Ben Ali’s regime. “I’m not here for politics. I’m here to pay homage to a region thanks to which Tunisia is acquiring its freedom. It’s thanks to this region that I am here in Tunisia. It’s my duty to come here,” Marzouki told AFP. CNN) — Tunisia’s interim prime minister said Friday that his country would hold its first free democratic elections since gaining independence, vowing to leave politics after those elections. “We want to make the next elections the first transparent and legitimate elections since independence,” Tunisian Interim Prime Minister Mohammed Ghannouchi said Friday on state-run Tunis TV. “After this transitional period — with all honesty — I will leave any political role I have even if I was selected or appointed,” he said. “I will leave political life and retire.” Tunisia gained independence from France in 1956. Ghannouchi’s remarks came in an interview with two independent journalists on Thursday that Tunis TV aired on Friday. Ghannouchi spoke of coming political reforms that he said would “scrap all undemocratic laws including laws involving political parties, the elections, and the anti-terrorism law that was abused by the former regime.” “I lived like all Tunisians, in pain and fear,” under former President Zine al-Abidine Ben Ali — who was ousted in a rebellion a week ago — Ghannouchi said. Ghannouchi resigned from his ruling party this week and was appointed interim Prime Minister by the interim President Fouad Mebazaa. Tunisia’s new government is interrogating 33 people from Ben Ali’s entourage, a top official said Friday, while 1,200 others who have “spread terror among the population and carried out unacceptable acts” have been arrested, according to state media. Tunisia’s Interior Minister Ahmed Friaa announced the arrests in a news conference, saying that “33 members of families close to the former president have been brought to justice and are now being interrogated.” “These people’s jewels and huge sums of money in their possession have been seized,” the country’s official TAP news agency reported, citing Friaa, a holdover from the previous government. In the interview that aired Friday, Ghannouchi said, “We have frozen their bank accounts and properties in the country,” referring to assets belonging to families close to the former president. “A judge was appointed to determine how to deal with their wealth,” Ghannouchi said. He said that the Tunisian government is trying to freeze money belonging to relatives of the former president and said that the money would eventually be returned to the Tunisian people. Former presidential guard director Ali Seriati is among those being interrogated, Friaa said. Friaa also confirmed earlier reports that Imed Trabelsi, the nephew of the ousted president, is among those being interrogated. The identities of those being questioned will not be released until “they are judged,” TAP reported. Some of the 1,200 people arrested by the new government have been released, Friaa said, while 382 others face charges such as carrying illegal firearms, looting and committing violence. Friaa described those who’d been killed in Tunisia’s recent uprising as “martyrs of the Revolution,” according to TAP. He said that all political parties that have applied to be officially authorized “had received positive reply,” according to TAP, including the Green Tunisia Party, the Left Socialist Party and Tunisia’s Patriotic and Democratic Labour Party. Friaa also said that a new group called the Baath Party — which appears to be an offshot of former Iraqi leader Saddam Hussein’s party — had also applied for authorization. Video from Tunis TV showed thousands of protesters in the capital, Tunis, for another day on Friday, calling the new government a sham and demanding that officials with connections to the old guard be fired. On Thursday, Tunisia’s new government announced it will recognize political groups banned under the regime of Ben Ali and grant amnesty to all political prisoners. The Thursday announcement followed the first meeting of the new cabinet formed by the North African country’s interim leaders as they and other former members of Ben Ali’s ruling party tried to climb from under his shadow. Ben Ali’s Constitutional Democratic Rally’s central committee was dissolved earlier Thursday, and all Cabinet members who once belonged to the party have quit it. The party, known as the RCD, suffered a major blow earlier this week when Ghannouchi and interim President Mebazaa submitted their resignations from the party, though they remained in the government, Tunis TV reported. Mebazaa has said he plans to sever “any link with the past,” referring to the unpopular years of the former regime’s authoritarian rule. His government is tasked with leading Tunisia toward new elections. But for many Tunisians, the resignations and promises are not enough. “The Tunisian people don’t want this party, this dictatorial party,” English teacher Mohammed Basha said. “We want a real revolution. We don’t want any more lies, because we are fed up. Twenty-three years of lies.” Ben Ali ruled Tunisia for 23 years. The RCD initially formed a consensus government with the opposition, but protesters demanded that members of the old administration — whom they called “leftovers” — be swept out of power. Ben Ali’s ouster followed weeks of protests over what discontented Tunisians said were poor living conditions, high unemployment, government corruption and repression. They were sparked when Mohamed Bouazizi, an unemployed college graduate, set himself ablaze after police confiscated a fruit cart that was his source of income. He died early this month. More than 100 people were killed in protests that followed over the past five weeks, according to the U.N. Office of the High Commissioner for Human Rights. The fatalities include victims of live fire, suicides and weekend prison riots. The rallies in Tunisia, one of the Arab world’s most secular countries, have ignited unrest elsewhere in the region, including Algeria and Egypt. As unrest spreads across volatile Tunisia, protestors are mounting pressure on the country’s Prime Minister Mohamed Ghannouchi and his cabinet to quit. Thousands held demonstrations in Tunis, the capital city of Tunisia, as well as other cities and protested against the presence of Ghannouchi and other allies to ousted President Zine El Abidine Ben Ali in the new government. Country’s main trade union also called for a new administration and organized a protest march dubbed the Caravan of Liberation which set off from central Tunisia for the capital on Saturday. Tunisia’s interim prime minister, however, has pledged to leave office after elections, which is expected to be held in the next six months, but he has given no indication of when the vote will be held. “We want to make the next elections the first transparent and legitimate elections since independence,” Ghannouchi addressed the nation on Friday on state-run Tunis TV. “After this transitional period — with all honesty — I will leave any political role I have even if I was selected or appointed,” he said. “I will leave political life and retire.” Police officers who previously defended the Ben Ali regime have also joined the protests. The ongoing unrest in Tunisia, which led to the ouster of president Ben Ali, seems to be spreading to other North african countries. On Tuesday an Egyptian man lost his life after he set himself on fire on the roof of his house in protest at the dire living conditions and joblessness in the country. Two other Egyptian men that were inspired by events in Tunisia attempted to set themselves on fire in downtown Cairo too. Earlier on Saturday, hundreds of Egyptians gathered outside the Tunisian Embassy in Cairo to show their solidarity with Tunisians and called for protests similar to those in Tunisia. Self-immolation attempts have spread across North African countries after an attempt by an unemployed Tunisian man to set himself on fire sparked an uprising that ended the 23-year rule of Ben Ali. A protest march against Tunisia’s interim government has reached the capital, adding to pressure on Prime Minister Mohamed Ghannouchi. Some 1,000 demonstrators from the rural area where protests against Tunisia’s authoritarian rule began had joined the “Caravan of Liberation” to Tunis. They want the resignation of Mr Ghannouchi, who served under ousted President Zine al-Abidine Ben Ali, and has pledged to quit after elections. A vote is expected within six months. The main trade union, the General Tunisian Workers’ Union (UGTT), has backed the caravan protest, which set off on Saturday from Menzel Bouzaiane – the town where the first victim of the uprising was killed by security forces in December. “The aim of this caravan is to make the government fall,” said Rabia Slimane, a teacher taking part in the caravan protest. A final day of mourning is being observed on Sunday for those killed in the unrest that led to last week’s toppling of Mr Ben Ali, amid speculation as to whether Tunisian unrest could spread to other countries. In Algeria, police broke up an anti-government demonstration on Saturday by about 300 protesters calling for greater freedoms. There were also protests in Yemen against the rule of President Ali Abdullah Saleh. Mr Ghannouchi has left Mr Ben Ali’s ruling Democratic Constitutional Rally (RCD) party and insisted that figures from the previous regime who have remained in positions of power – including the ministers of defence, interior, finance and foreign affairs – have “clean hands”. But this has failed to satisfy many opposition figures and protesters. On Saturday, policemen – who had defended the regime of the ousted president – were among those protesting, which the BBC’s Magdi Abdelhadi in the Tunisian capital says marked a very dramatic development. The official death toll during the unrest leading to Mr Ben Ali’s flight was 78, though the UN says more than 100 people died. Authorities have promised to investigate the deaths of protesters. Primary school teachers were reported to be planning a strike against the current government, which could hamper plans to reopen schools and universities this week. They have been closed since the final days of the unrest. Protests against Mr Ben Ali’s government began in December, driven by economic grievances and resentment about political repression. Particular anger was directed at the former president’s family, widely despised for its conspicuous consumption and perceived corruption. As the protests continued to escalate, Mr Ben Ali and his wife fled to Saudi Arabia on 14 January. Tunisian officials say they have arrested 33 members of Mr Ben Ali’s family. On Saturday, AFP quoted a Canadian officials as saying that one of the ex-president’s brothers-in-law had fled to Montreal.